Republicans, who lagged behind Democrats in the 2008 campaign in some key aspects of social media use, caught up to Democrats in the midterm election cycle. The “political social media user” cohort represented by these 22% of internet users voted for Republican congressional candidates over Democratic candidates by a 45%-41% margin, and Republicans’ enthusiasm for using social media matched that of Democrats. Among social networking site users, 40% of Republican voters and 38% of Democratic voters used these sites to get involved politically. 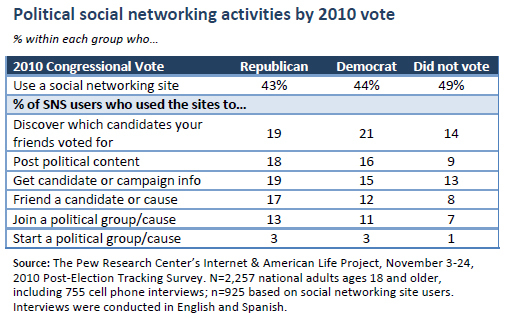 Further, Tea Party supporters were especially likely to friend a candidate or political group on a social networking site during the 2010 election—22% of such users did this, significantly higher than all other groups. Political social media users stand out for their overall use of technology. They are significantly more likely than other internet users to go online wirelessly from a cell phone or laptop (91% vs. 67%); own a laptop computer (79% vs. 63%); have a high-speed broadband connection (94% vs. 80%); and use the internet on their cell phone (61% vs. 40%). Demographically, political social media users are younger and somewhat more educated than other internet users. Two in five (42%) are under the age of 30 (vs. 22% for the rest of the online population) and 41% have a college degree (34% of other internet users have graduated from college). However, they look quite similar to the rest of the online population in their racial, gender and income composition. Some of the charts in this report are interactive charts developed by iCharts. These graphics can be embedded in any blog or website, or saved as a JPG, TIFF, or other static image, by following the instructions below. 1. Click the Embed button located under the chart. 2. Copy the code provided in the pop-up box. 3. Paste the code into your blog or website. 1. Click the Save button located under the chart. 2. Select an image format type. 3. Save the image of the chart to your computer. Three-quarters of US adults are internet users, and of these 61% use social networking sites such as Facebook or MySpace and 8% use Twitter. As Americans increasingly use these sites to connect with public figures, find out about and respond to events in the news, and share their views on a range of topics, politicians and political groups on both ends of the ideological spectrum have begun using them to organize and communicate with their supporters and the public at large. In our 2010 post-election survey, the Pew Research Center’s Internet & American Life Project set out to evaluate the current state of political engagement on Twitter and social networking sites. The results reported here are based on a national telephone survey of 2,257 adults conducted November 3-24, 2010. The survey included 755 interviews conducted on the respondent’s cell phone, and interviews were conducted in both English and Spanish. For results based on internet users, the margin of error is +/-3 percentage points. This is the first non-presidential election in which the Pew Internet project has conducted polling on the use of social networking sites for political purposes, and the first election of any kind in which we asked detailed questions about the use of Twitter for this purpose. Take part in political groups or causes – 10% of social networking site users joined such a group, and 2% started their own group on these sites. This works out to 6% and 1% of internet users, respectively. Taken together, that means that 35% of all social networking site users got involved politically on these sites during the 2010 elections. That works out to 21% of all adult internet users. Half of these political social networking users took part in one of the six activities we asked about in our survey, while the other half engaged in two or more activities. Recent Pew Internet research indicates that adults over the age of 50 are one of the fastest-growing cohorts when it comes to using social networking sites,1 and in 2010 older users took to these sites in relatively large numbers to get involved in the political debate. 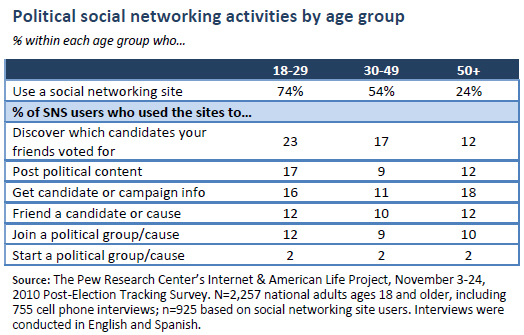 Fully 33% of social networking site users over the age of 50 used these sites during election season to get political news, post political content, get engaged with a candidate or cause, or discover who their friends voted for—that is only slightly less than the 42% of profile owners ages 18-29 who did so. To be sure, young adults overall are much more likely than their elders to use social networking sites (three-quarters of 18-29 year olds use these sites, compared with one-quarter of those 50 and older), so the use of social networking sites for political purposes is more widespread within the young adult population. However, to the extent that people are users of social networking websites they are increasingly likely to use those sites for political purposes—regardless of their age. Note: Click here for instructions on how to save or embed the interactive charts in this report. Looking more deeply at the individual political social networking activities we measured, the main difference between young and old social network users pertains to using the sites to discover who one’s friends voted for in the most recent election—social network users ages 18-29 were roughly twice as likely to do this as those ages 50 and older. This is most likely due to how many more young adults use social networking sites; the more of your friends are on these sites, the more likely you are to know someone who publicized who they voted for. Young social network users are also somewhat more likely than older users to post political content on these sites, although for the other activities in our survey there no major differences between young and old social networking site users. Overall, Democratic and Republican voters are equally likely to use social networking sites (among internet users, 58% of Democrats and 54% of Republicans do so). This is a notable change from the 2008 campaign, in which Obama voters were significantly more likely than McCain voters to use these sites, and reflects recent overall trends in social networking site adoption by older adults (who tend to lean Republican in their voting habits). Similarly, both supporters and detractors of the “Tea Party” movement each use these sites at roughly similar rates (54% of internet users who agree with the Tea Party movement and 60% of those who disagree with the group use these sites, a difference that is not statistically significant). In addition to using social networking sites at similar rates, voters from both sides of the political aisle are equally likely (and more likely than non-voters) to use these sites for the purpose of engaging with the political process. Among social networking site users, 40% of Republican voters and 38% of Democratic voters used these sites to get involved politically, compared with 29% of non-voters. The social networking activity with the biggest gap between voters (of any party) and non-voters relates to posting political content on online social networks. Among social network site users, 18% of Republican voters and 16% of Democratic voters did this, compared with 9% of those who did not vote in the 2010 elections. Similar splits in the use of social networking for political reasons between the politically active and the less engaged can be seen when we compare those who feel strongly one way or another about the Tea Party movement to those who either have no opinion of the movement or have not heard of it at all. Social networking site users with views (either positive or negative) about the Tea Party movement are significantly more likely than other social network users to have used these sites to take part in a range of political activities. 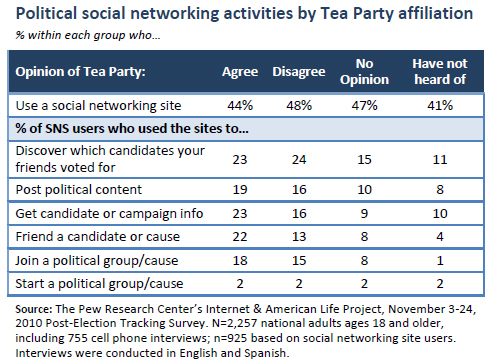 Tea Party supporters were especially likely to friend a candidate or political group on a social networking site during the 2010 election—22% of such users did this, significantly higher than users with negative views about the tea parties, as well as those with no firm opinions either way. Taken together, that means that 28% of Twitter users (representing 2% of the adult internet user population) used the site to engage with the 2010 election in one way or another. We did not ask the same set of political activity follow-up questions of Twitter and social networking site users—for example, questions about discovering who your friends voted for and joining or starting political causes were only asked of social networking site users. However, comparing similar activities side by side, social networking site users and Twitter users utilized these sites in similar ways during the campaign. Why do voters follow candidates on social networking sites or Twitter? One in ten social networking site users (11%) and a similar proportion of Twitter users (11%) followed or “friended” a candidate for office or other political group involved in the 2010 election—that works out to 7% of all internet users. In our post-election survey, we asked these “political friends and followers” a series of follow-up questions that probed more deeply on their reasons for following politicians and political groups on Twitter and social networking sites. Specifically, we presented three statements and asked whether they represented a “major reason,” a “minor reason,” or “not a reason” why they choose to follow political candidates or groups. The main reason our survey respondents gave for following political groups on social networking sites or Twitter is that doing so helps them feel more personally connected to the candidates or groups they follow—36% said that this was a “major” reason they followed these groups or candidates, and an additional 35% said it was a “minor” reason. They responded less strongly to the statement that following these candidates helps them find out about political news before other people do—one in five (22%) said this is a “major” reason why they follow or friend political candidates or groups, with 43% saying it is a “minor” reason. Relatively few of our respondents say that they follow political groups through social media because the information is more reliable than what they can get from traditional news organizations—while 21% said that this was a “major” reason they do this, fully half (47%) said it was not a reason at all. Generally speaking, followers of candidates or campaigns find the information posted on these sites relevant and useful. Two-thirds (67%) of those who follow politicians or other political groups on social networking sites or Twitter say that the information posted by those they follow is interesting and relevant, compared with 32% who feel that mostly uninteresting and irrelevant. Additionally, a total of two-thirds of these individuals say that they pay attention to most (26%) or some (40%) of the material posted by the politicians or groups they follow—24% say that they pay attention to only a little of it, and a one in ten (9%) say that they don’t pay attention to any of this material.